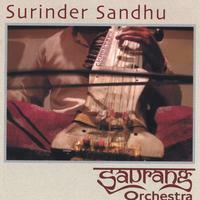 Saurang Orchestra was Surinder's debut solo album which featured players from The Royal Liverpool Philharmonic Orchestra, guitar legend Steve Vai, saxophonists Andy Sheppard and George Brooks and some of India's finest soloists. ​For this record, Surinder reached into his more contemporary composition style, whilst allowing the virtuosity of the soloists to shine through. ​The album received high praise all over the world with no exception and stamped Surinder's place firmly as one of the foremost leaders in the world of Indian Jazz. ​This album was recorded in Birmingham, London & Liverpool in the UK, Los Angeles and San Francisco in the USA and Calcutta in India during 2002.